Lighthouses are beacons that direct marine travelers. They also are geographic reference, a piece of history, and places to visit. 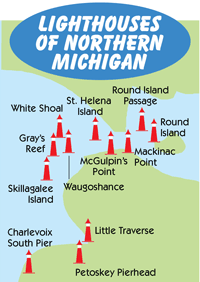 In Northern Michigan, there are two historic lighthouses that can be toured, McGulpin Point Lighthouse and Old Mackinac Point Lighthouse.In addition, there are many working lighthouses on Lake Michigan. Unlike the historic ones built with a keeper's quarters attached to a tower, these lighthouses are just towers. Many are located off shore and not accessible accept by boat. Waugoshance Point is a brick lighthouse with a birdcage-style apparatus around the light that was built in 1851. 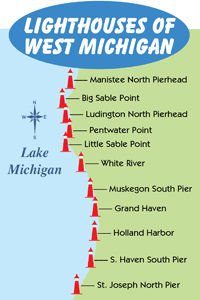 It is located straight west of Mackinaw City leading into the Straits of Mackinac and west of McGulpin Point Lighthouse. It was deactivated in 1910. 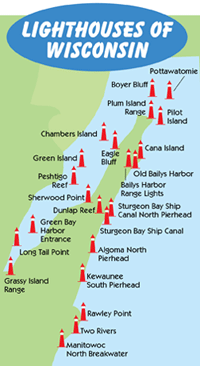 White Shoal Light was built in 1910 and is the only red and white candy striped lighthouse in the Great Lakes. 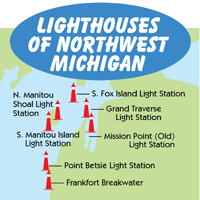 Located 12 miles northwest of Waugoshance Lighthouse, it is owned and operated by the US Coast Guard. Grays Reef Lighthouse is a US Coast Guard lighthouse built in 1937. It is located six miles offshore off Waugoshance Point and marks the outside edge of the Grays Reef. The original fresnel lens can be seen at the Harsha House, Charlevoix. 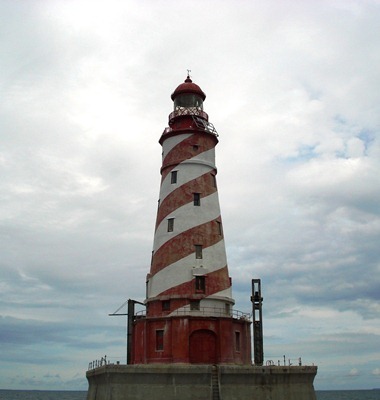 Skillagalee (Ile Aux Galets) Lighthouse, nicknamed Skilly, was built in 1851. It was once a large tower with keeper's quarters but only the working tower remains. Located six miles west of Cross Village, it marks the ever growing Skillagalee island--becoming bigger as lake level's drop. The Charlevoix South Pier was built in 1911 of wood and then replaced with a steel structure in 1948. The Charlevoix Historical Society maintains this still active light.